Today, let's spend some time learning about Mitch McConnell's plan to sort of repeal and kind of replace the Affordable Care Act. deferred because of a health care issue involving that "loser for being captured" Senator John McCain. The octogenarian Republican from Arizona had a blood clot removed from above his left eye, and will be recuperating at home rather than travelling to DC this week. Because we know of two senators who are definite 'no' votes on McConnell's bill, there will be no vote at all unless the other 50 yes votes or noncommittal senators are not present and accounted for, and unless VP Mike Pence is available to break the tie as everyone expects, at least right now, will happen. One of those two no votes is Kentucky's Rand Paul, who visited with Chris Wallace on Fox News Sunday. Wallace wasted no time with this interview. CW: Senator, let's start with the bottom line. Whenever it comes up, whenever Senator McCain is in good health and comes back, does ...McConnell have the votes to pass this revised bill? RP: You know, I don't think right now he does. And the -- the real problem we have is, you know, we won four elections on repealing ObamaCare, but this bill keeps most of the ObamaCare taxes, keeps most of the regulations, keeps most of the subsidies and creates something that Republicans have never been before, and that's a giant insurance bailout superfund. That's not a Republican idea to give private money to a private industry that already makes $15B in profit. CW: So if this bill does not pass, what happens? RP: Well, you know, what I've suggested to the president... and I've told him, I think we can still -- if -- you know, if this comes to an impasse, I think the president comes - jumps into the fray and says, look, guys, you promised to repeal it, let's just repeal what we can agree to and then we can continue to try and fix, replace, or whatever has to happen afterwards. But one thing we should to is try to repeal as many of the taxes, as many of the regulations, and as many of the mandates as we possibly can. I still think the entire 52 of us could get together on a more narrow, clean repeal, and I think it still can be done. ... back in January you said that you had told the president, and he agreed with you, that you needed to repeal and replace at the same time? Paul believes that his ideas to replace can actually be part of the repeal, so there was no change of heart. ...my definition of replace is lot different than some of the big government Republicans. My ideal always was to replace it with freedom, legalize choice, legalize inexpensive insurance, allow people to join associations to buy their insurance. I'm still for all of those... most of the ideas I've had on letting people join groups to buy their insurance you know, letting the plumber and his wife join a large group like the chamber of commerce, those ideas are actually welcomed by virtually every Republican. That passed in the House...unanimously. the 'fundamental flaw" - mandates - leads to adverse selection, also called a 'death spiral', and the Republican plan will continue it and subsidize it. Medicaid reform - at least some of it, anyway - is good. He makes the case that slowing the growth of Medicaid, which he says McConnell's plan does, is not the same thing as cutting Medicaid, which is what Wallace said it does. He supports the proposed limited block grants vs. unlimited Medicaid funding, which is what he sees with Obamacare. there's an inherent issue with making a 10-year plan, because things will get done in the early years of the deal, but by the time the hard stuff come up, it could be a completely different Congress, and things don't always get done they way they were intended. they could do two bills simultaneously - a repeal bill, and a spending bill, which Democrats and moderate Republicans could both support, getting them to 60 votes on the spending bill (the repeal bill would still be considered a budget bill needing only 51 votes). In the end, Medicaid reform is not enough for him to support the bill. But the bottom line is, I'm not willing to trade Medicaid reform for an insurance company bailout, an insurance company entitlement. They call it a temporary stabilization fund of nearly $200B. It's never going away because they do not fix the death spiral of ObamaCare. The death spiral of ObamaCare will remain with the Republican plan. And that's (why) I just can't support it as it's written. The panel doesn't seem to like the bill all that much either -- I think the best that anyone said was that it was a first step in the journey to repeal, not the final step. 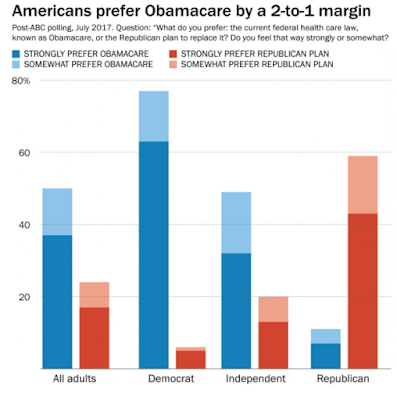 One last note - in a new ABC News/Washington Post poll released today, respondents prefer Obamacare over McConnellCare by a 2-to-1 margin.